Next month, we are restarting my Adventures in Shadow campaign, set in Gloamhold. (Hooray!) 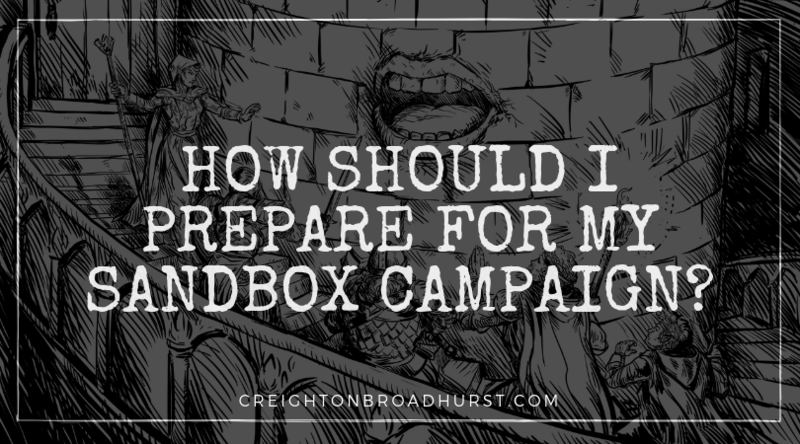 The campaign is going be much more of a sandbox campaign than we’ve recently run, and this presents a minor problem for me as I love to be super prepared for the game. So I thought I’d ask you, how do you prepare for a sandbox game? Help me prepare my game, by leaving your advice in comments in the below. I find the trick is to prepare nothing, incase I end up steering the party down my road. I’ll look at the area the PC’s are in, their travel options. Then I’ll make a list of ideas for encounters, names for Npc’s and other local happenings. Then wait for the party to tell me what they are doing. Start with a simple broad plot hook that can cover all the characters, make a safe zone it doesn’t have to be a stronghold you can be creative a wrecked spelljammer. make areas to explore & fight, a forest area some desert area coastline, dungeons and a few ruins from there it’s all random encounters use premade tables or create your own from monsters NPC’s even weather and terrain. have a session zero discussing character backgrounds create a simple narrative that all agree upon. All sandbox campaigns end in TPKs. Remember have fun most of all. I try to come up with several “plots” that my players can uncover and interact with. I move those plots along at appropriate time with or without the PC’s involvement. This way the players uncover and deal with whichever plot(s) they wish. I also try to ensure I understand their PC backgrounds so I can either integrate elements of their backgrounds into the plots or just make those elements their own plots. Make a map. Place some points of interest on the map. Make notes about each point. As soon as you have a handful (I like to make things into tens, so ten points is a good start) develop your notes a bit further. If you’re happy, appoint ten more and make at least half of them have a connection to the older batch of ten. Repeat the notes process if you like for the new batch or the old as well. So now you have a map with twenty points of interest, some of them linked together (example: the Blacksmith’s Store is linked to the Blacksmith’s House, the Druid’s Grove is linked to the Sacred Fountain). Finally, if not already done so, make a point of interest that is a potential safehouse for the PCs. An Inn or Tavern, Ruined Watchtower etc, can be ideal bases of operations for the PCs as soon as they resolve some problem (i.e. encounter) and clean it out. So now you have your setting, prepare some encounters. Some of them might be random, some not random at all, but all of them should have some connection to the points you prepared. Encounters are fun because they are dynamic and set hooks, pace and make the setting alive. Next up are the hooks. Prepare two or three of them. Look at your points of interest and their links (if any) and their encounters. Start connecting dots. Maybe the Blacksmith’s son has gone missing as well as his best stock of weapons. Maybe the Druid has encountered a lot of strangely ill animals. Maybe the wolves that attacked the heroes had a strange rune engraved on their foreheads. The hooks lead to short adventures and all of them lead to a bigger one. The Short Adventures are intended to make the players native to your Setting and help them establish connections to the Setting. This is imperative to a Sandbox Campaign. So, prepare two or three short adventures according to the initial ideas (aka hooks) you had. According to my design all of these hooks coincide to a bigger adventure (see below) and they seldom are bigger than three levels. All the small evils that have happened are due to a bigger lurking behind. The marked wolves, the missing Blacksmith’s son, the decease of the animals, all are due to the primeval spirit that has awakened deep in the nearby woods. This is a bigger threat that can engulf the Setting you’ve prepared (as opposed to the smaller threats that can only affect an individual point of interest). Most times I do this planning in one or two planning sessions. Steps (1) to (3) are the most imperative for session 1 of the actual adventure. You can proceed to steps (4) to (5) as the players start interacting with your Setting. And of course, because this is your (plural) game, you can change all the time things as you go. I prepared random generator tables and an interesting background for our upcoming (tomorrow!) Sandbox campaign. I’m going to drop something at your Patreon… The Shattered City. I usually start with 2 things: a map and a big event. The theme of the campaign is on that event, but I don’t place anything on the map just yet. What I want is to see where are the geographic chokepoints, interesting features and that’s it. Depending on how I want to focus on exploration I may create a rough sketch to show the players the general landscape. The second step is to create general lists of monsters, one for each biome. Don’t worry about it right now, but have at least a dozen monsters for each terrain. The third step is to create the PCs. Then, borrowing from Apocalypse World, I start to ask my players relevant questions. A fighter? Is there an arena nearby? A wizard? Are there magic enclaves or orders? And so on. For each answer, I create that point of interest on the map. After that, I create the starting quest (even sandboxes need a beginning). Almost done. Finally, let me talk about those monster lists… They are quantum monsters, but on a good way. See, when the party has a wandering encounter, I roll on those lists. The indicated monster shows up, as usual, but I ALSO add a LAIR on that hex or at an adjacent hex. Now I have the source of that monster, the place it calls home. As the party is exploring, my random tables will help me populate the environment: monster lairs, settlements, wonders, pitfalls… Almost no prep and, voilá, you have a dynamic hexcrawl sandbox. o An orc warlord receives a vision from his god. o With the vision to guide him he challenges & defeats the old leader of his tribe. o He gathers several other tribes to his banner. o Scouting parties begin to attack small outlying human villages. o A couple of larger towns fall to the Orc advance. o Warbands of marauding orcs become a common hazard. o The warband attacks the human capital. Whenever a period of time passes I mark off the next item on the list to illustrate the plot timeline moving along, it also means all I have to do to find out what is going on in a game is to look at my collection of lists. If the PCs interact with the plot and change stuff then I can make alterations to the list to reflect this. This is amazing. I was doing the consequences thing as well but more of freehand, this definitely can keep things more organized. Thanks!!! I’m running my first Sandbox campaign, and I did a lot of research on how to run an open campaign like that. One of the more helpful resources was a guide to Sandbox/Hexcrawling on DM’s Guild. (I forget the title; I will look it up). -Make your adjustments to the core expectations. For my campaign, I wanted to have a Roman Empire analogue, beyond which was the Northreach, with the Empire seeking to establish trade with the distant kingdom of Draconia. I also wanted a low magic campaign and made magic a highly-controller and supervised, academic affair. Then, with the inspiration of Matt Colville, I thought through the ideals of the empire and made gods to represent those ideals. All of this helped me think through some of the major factions of the game world. -Think through what can be found in your sandbox: monsters, ruins, discoveries, dungeons, DRAGONS! I made HUGE random encounter charts to help me flesh out what can be found in any given region. For each sub-region (“Ravenwood Forest”, “Aquamere Plains”), I made two charts, one with encounters (peaceful, and hostile, and potentially hostile) and another with discoveries (ruins, a farm, signs of a previous battle, etc.). Used together, they can create very evocative scenes that I can plug in to our adventure. -Think through how you are going to get your PC’s to explore the territory. For a sandbox to work, the players have to have quest agency. I am writing my story (read: main conflict and BBEG) as I understand more about the backstories and personal objectives of my characters. Until I start laying down the threads of that conflict, and they notice them, the sandbox will appear unconnected. My solution to wandering aimlessly was to create a “Quest Board” where adventurers and mercenaries venturing into the Northreach can find a place to start and a promise of some coin. All the different factions and even other adventuring companies can post quests on the board. I am heavily indebted to the AngryGM’s article on overland travel and making it more interesting. I’ve created a worksheet to help me think about encounters and discoveries during travel, rolling for encounters and such at the START of the day. I’ve also kludged together a system for getting lost. Main thing is, you want the whole region to be dangerous and interesting, not just the points of interest. – Leave blank space and fill it as you need it. This was the hardest part for me to grasp, but I love it now—and it may make it hard to go back to a standard adventure. Don’t overfill your map. Leave vast swaths of undetermined land (other than topography, you do need that), where you can turn random encounters/discoveries into points of interest. The players don’t know what lies hidden in the woods, and you don’t have to either. But, they’ve been wandering around forever, and eventually they’ll find some ruins, or an ent-moot, or a hamlet, or a temple. Some of these you may have placed on the map and not fleshed out, but many you could flesh out and not place on the map until you need something of interest to be there. Let your map grow with the game! – Last, communicate with your players. Your players have to know the sandbox style depends on their active engagement with the world you set before them: not with the lore, but with the dramatic possibility. They need to have a backstory and personal reasons to delve into the dungeons, to play the hero, to find a lost artifact. Let them know that you are following their story decisions this game, rather than them following your story decisions. I hope this was helpful! Thanks for all you do. 1) Get the party together before the game starts. Sandbox games are great for starting at higher than first level, and this gives the group the chance to chat about how they met and why they are together. Honestly a barroom scene to start is a lot better if it starts with the group all walking in as a team. 2) confine the sandbox, a little. Limit the game to an area about 10 days travel in any given direction from the starting town, stronghold, inn etc. that gives you room to include a forest or two, some mountains, a swamp. . . .varied terrains to explore. It also gives you enough room that you can have more than one group or persons machinating their evil ness through the area, some with connections and some with out. which leads too…..
3) Multiple plots. THere’s a lich in the temple on the mountain to the west who has a whole cult spreading into the area looking for magical artifacts. There is a dragon in the swamp to the south who is just a problem because he’s there. There’s a baron who is in league with a demon who has granted him an army of Slaad, and he might try and make a pass at the throne. .. throw in a few more and you have some real sandbox action happening. just remember. . . .
4) as Matt Coleville says, “The Clock is always ticking”. In a sandbox game time is much more important, as any given adventure the players go on, is choosing to not go on the others, and in that time those other plots should move, maybe not much, but some. Always change something about the starting town or strong hold when they get back to reflect it, maybe a caravan came in, or the innkeeper seems quiter than usual, maybe there are a host of new guests at the inn because their farm steads are now a battlefield. Maybe they have to sneak into town because that baron took over. 5) vary the length of your adventures, and be sure to include lots of down time. a quick jaunt into the forest temple, a week for the fighter to learn a craft (smithing most like, but maybe macrame, we don’t judge here) and then two months to plunder the ruined keep of Garmasuul. Definitely down time for mages to research spells, and everyone to pursue unique goals. even with downtime though, remember number 4. Ask your self WHY things are going on around you? Is the local lord trying to usurp more power? Is there a mysterious absence of the local lord? What politics are occurring and why? Is a local villain about to be executed and is there a plot to free him? Add a festival or celebration in a town to make the town feel alive? For a sandbox, draw a map then pepper it with lots and lots of short (or long) adventures. In the old days I used White Dwarf magazine adventures, but now we can use: one page dungeons, free BFRPG adventures, Dyson’s Delves and umpteen other sources. My first step is to come up with a theme. Once I do that I come up with that I come up with questions about the theme. Why was the temple lost? Why would someone want to find it? Then you answer those questions. Jurras was a high priest of Pelor. Clonmel a necromancer in alliance with a coven of hags and their ogre minions. Who employed the Ravensblod clan of Hobgoblins to attack and invade the Temple. Destroying the surrounding community in the process. It housed a great number of books of arcane and planar lore. Legends state that it may have even held one of the great books of power such as the Book of Exalted Deeds. Map, with locations. This includes locations of interest but also any overlapping areas of lair effects. As well as regions of specific monsters. Encounters, for various random areas and set pieces. Set pieces, locations that are more than places of interest. Rather places that will make unique encounters. A crevasse over a lava tube. A mountainside that is about to have a major avalanche. Examples: One game I had an Ambush rock. A small boulder that was on the main trail where bandits and such that had a habit of always leading to encounters. Example: a mentor needs a spell thought contained within. One which will help break a curse. Side Quests. The ghost of a dead Paladin who haunts the main trails. An idea for the main protagonist. Maybe the Necromancer? Apprentices? Or the hags? More than one? If more than one what does group Alpha do if group Beta is removed by the players? 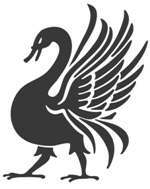 Is there a Group Gamma or others who will step in with a power vacuum? Game Twist? Maybe the place they think the library is, is not actually there. Instead its a tomb of the A Mud-Sorcerer. If so do I need a variation of Sorcerer or a prestige class available? I don’t have to use all of these at one time. Just a basic over view. The rest can be added in as the game progresses. If the players guess the plot of the current quest do I throw them a curve? If they come up with a better more paranoid idea than I did do, I change my ideas to fit their story that may be better than mine? Anyway another long post. I enjoyed the ones others did. I hope mine isn’t to verbose. (1) Focus on what you need, then do what you want. (2) Try to get at least 2 hours game play out of every hour of work. (3) Make sites inter-relate, so that going to the Forest of Doom makes the PCs interested in going back to the Shrine of Evil Chaos. (4) Have enough things happening that the PCs must make choices about where to spend their energy. 1) Practice choosing the most logical answer. Meaning, when players ask questions, when NPCs make decisions, when going over wrap-up and trying to decide what the evil priest is going to do next session . . . what is the most logical thing to happen? I do this because otherwise I might try to have something “cool” that pushes the “story.” But story is what happens after the game, when the narrative is constructed around the characters follies and successes. Plus, the most logical response is likely less convoluted than a story-based response, so it’s easier to remember. Less rolling also seems to make players think you’ve got more “story” than you actually have. That’s my experience, at least. 2) I pre-roll some randomness. Overland random encounters get rolled in advance, because the terrain the characters are in isn’t going to change that much, and you just know that when the characters get attacked by a randomly rolled owlbear, they’re gonna want to go find its lair. Better to have some of this stuff on hand early. Minor things, but my brain gets busy with what the players are doing, so I to pre-think what I can, because players deserve the attention. The real pitfall in a Sandbox campaign is the lack of coherency – when the players can do ANYTHING, nothing is special. Where most of them fall apart is when the players get disinterested because they feel like they’ve been wandering around doing random stuff, which, is exactly all they’ve done. So what a sandbox campaign needs is a world that moves whether or not they do. I prefer to have some BBEGs doing BBEG stuff, with counterpart good guys, and kind of a set expectation of “if the players do nothing, by a certain time BBEG’s plot A comes to fruition”, and so on. Make the good guys and bad guys around them be moving and doing stuff as they are. What this means is a bit of logistical prep in between sessions – you have to know who your good/bad guys are, where they are, what they’re trying to accomplish and how. And figure out how long each leg of their journeys takes. So, after a session where the players have travelled for a week, you have to check on each NPC plot/action. Maintaining that 3×5 index card style (See the Lazy Dungeon Master) works very well, and if you keep it to a couple sentences, rarely will this take more than 15 minutes between sessions. It adds buttloads of verisimilitude when the players are surprised to come upon the aftereffects of a BBEG’s plan (like a smoking ruin of a town) – especially when they had earlier learned hints that this was coming. Other than that, as below.. prep maps, factions, timelines, and get all your random charts handy.